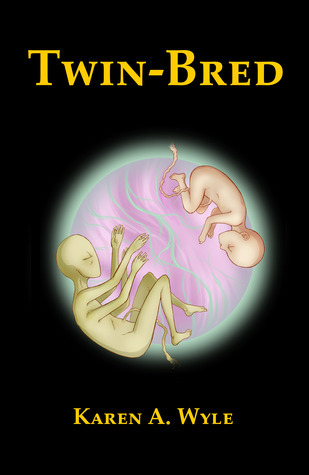 Today I have a special guest post from Karen Wyle, a character interview with Mara Cadell from her book Twin Bred. Introductory Note: Mara has a secret to keep, and her answers to these questions reflect that. The secret: that her fraternal twin brother, Levi, died shortly before birth, and that she has dealt with the trauma of that loss by keeping him alive in her mind as a companion. When did you first conceive of the Twin-Bred project? In one sense, the idea first occurred to me when I was quite young — a child, in fact. I believe I was seven years old. I was — I was aware of the deep bond between twins, and I thought what a shame it was that humans and Tofa couldn’t be twins, so they’d get along better. It was several years later that I learned about host mothers who carry fetuses for other women. I immediately recalled my earlier fancy, and wondered if the physical obstacles to cross-species implantation and so on could be overcome. Do you regard the Twin-Bred — emotionally speaking — as your children? Not really. The relationship isn’t that — personal. I don’t hover and worry over every little bump and bruise, or concern myself with fusses and tantrums. The ones whose host mothers have left would be much more likely to go to one of the nurses, possibly Chief Nurse Gaho, for something close to maternal attention. I think my feelings are more like those of a teacher who takes pride in her students’ progress and achievements. Although I am quite protective of the Twin-Bred’s safety and well-being. You might say intensely protective. The official name of the Twin-Bred project is the Long-Term Emissary Viviparous Initiative, or LEVI. Is it a coincidence that those initials spell a name? Is the project named after someone in particular? That’s a personal matter. Next question? Would it be accurate to say that LEVI would never have gotten off the ground without funding and support from the governing Council? Certainly. I’m no fundraiser. I have no particular gift for stroking egos and such. I suppose that if I’d happened to know someone both wealthy and interested, we could have managed with private funding. Most likely, we would still have had the same problems — excuse me, occasional issues — about the time frame in which results could be expected, and exactly what return on investment we could produce. Although we would have had personal continuity, instead of the turnover we’ve naturally seen on the Council over time. I understand you’re an artist. What are your favorite subjects? I don’t usually call myself an artist. I like to sketch. I’ve done a little painting, but I rarely have time for it. My cartoons tend to be about things that annoy me. It helps me keep my temper. I see you have a cartoon on your desk. May I take a closer look? This cartoon shows a woman sitting up in bed. It’s you, isn’t it? And she’s holding a pillow at arm’s length, and the pillow is sticking out its tongue at her. And one of the moons, the larger one, is showing through the window — but it’s making a really nasty face. I don’t always sleep well. And on occasion my dreams can be less than pleasant. Now I don’t wish to be rude, but I really do have a great deal to do, and I’d best get back to it. Thank you for stopping by. I’ll have someone give you a tour of the facility on your way out. It’s worth seeing. Thank you Karen for the wonderful interview. It was great to get to know Mara a little more outside the story. In Twin-Bred, the human colony on Tofarn and the indigenous Tofa have great difficulty communicating with and basically comprehending each other. Scientist Mara Cadell, who lost a fraternal twin in utero, proposes that host mothers of either or both species carry twins, one human and one Tofa, in the hope that the bond between twins can bridge the gap between species. Mara has secretly kept her own twin, Levi, alive in her mind as a companion and collaborator. I'm so glad! Thanks for visiting!